This is a sponsored conversation written by Wrapped Up N U on behalf of Bobbi Toads. Give the gift of sparkle with shoes from Bobbi Toads. We were thrilled to be able to try out a pair of the Bobbi-Toads Light-Ups in the color Kelly. The Light-Ups are currently available in 8 different cute styles that are sure to put a twinkle in any little girls step. Simple, yet trendy and fabulous. The Kelly style gives you fun and fashion with its seafoam green canvas fabric and matching laces. These Bobbi-Toads Light-Ups give you all the flash without the splash. No polish for these shoes, the lighted toes are your design. Want even more flash? You can decorate them any way you want with our Bobbi-Stickers! Bobbi-Toads light-ups, the toes light up in 5 different colors and can be decorated with Bobbi Stickers or nail stickers. The uniqueness makes a creative outlet for self-expression. The durability and fun factor make this a must-have for the Holiday Season. 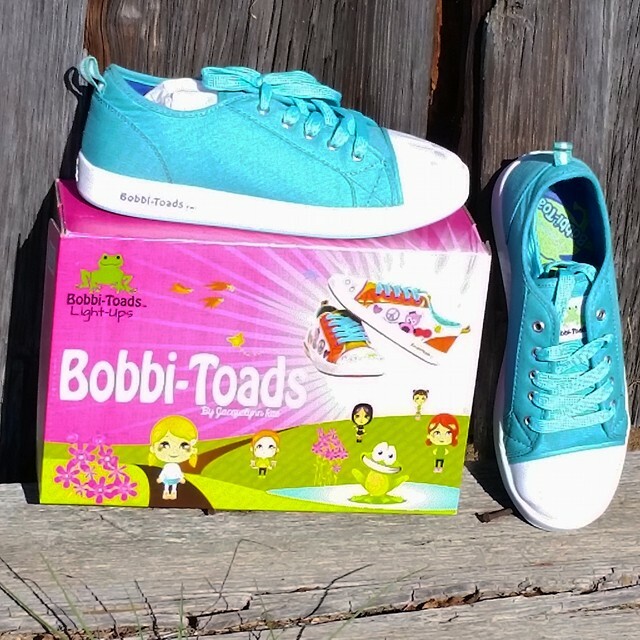 Bobbi-Toads paintable's are the first-ever sneaker that features little "toes" embossed into the rubber cap, which can be painted with any nail polish over and over again! 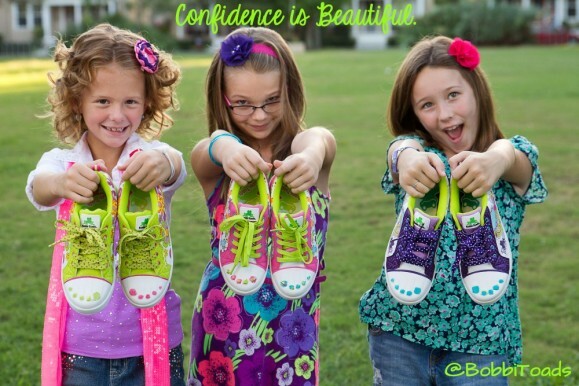 Bobbi-Toads Paintable Sneakers can be painted with any nail polish, over & over again, just like your real nails! When you’re ready to switch up your style, simply use nail polish remover to take the old polish off, and you can repaint your Bobbi-Toads sneakers to match any outfit or mood! Bobbi-Toads are eco and animal-friendly! Bobbi-Toads were patented, created and are designed by a Father-Daughter team, Bob & Jacquelynn Stanley - it's all in the family. Starting at less than $50 a pair, they fit every parent's holiday shopping budget too! Bobbi-Toads also donates a portion of proceeds to charitable organizations including Our Lady of the Angels, an inner-city mission in the Stanley's hometown of Chicago. Also new for this holiday season are boy styles and Bobbi-Dobbiez, which make perfect stocking stuffers. These furry pals accessorize backpacks, shoes, watches or serve as fun hair ties at only $4.99 each so kids can collect them all! I love the paintballs and so will my great grand daughter. I like the paintables although all are nice. I like the cloud nine light up shoes. Bobbi-Toads paintable's shoes in Hally Rae. I would love the bobbie toad paintables shoes in holly rae for my granddaughter. I am sure my granddaughter would love the bobbie toad light up in holly rae. I would love to have the Bobbie-Toads by Halley Rae. I would love to have the Halley Rae for my granddaughter. The Bobbie-Toads are super cute. I know my family would love 'em! Any color mix and match, they are adorable! My favorite are the Staci pair! I would want the Halley Rae for my granddaughter. Aww, these are are just too cute. I can see any little girl loving these!